Showing results for tags 'a-26'. In 2019 ICM is to release a new tool family of A/-B-26B/C Invader kits: - ref. 48281 - Douglas B-26B-50 Invader, Korean War American Bomber - release expected in Q3 2019 Source: https://www.hannants.co.uk/product/ICM48281 - ref. 48282 - Douglas A-26B-15 Invader - release expected in Q4 2019 Source: https://www.hannants.co.uk/product/ICM48282 Dedicated decals by ICM: - ref. D48001 - Douglas A-26B/C Invader (WWII) - release expected in Q3 2019 Source: https://www.hannants.co.uk/product/ICMD48001 - ref. D48002 - Douglas B-26B/C Invader (Korean War) - release expected in Q4 2019 Source: https://www.hannants.co.uk/product/ICMD48002 V.P. 1/48 - Douglas A-26K "Nimrod" Counter Invader by Bobcat Hobby Model Kits - release in 2019 ? Bobcat Hobby Model Kits has just announced a new tool 1/48yh Douglas A-26K "Nimrod" Counter Invader kit - ref. 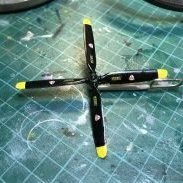 Source: https://twitter.com/bobcat_model/status/1083588949254098944 A direct competitor for the future ICM's Douglas A/B-26 Invader kits - link V.P. Hi, Now with the F4U-4 is all but finished, its time to continue with my 'build two at any give time - if you want a chance in reducing the constantly growing stash' policy. This time I selected to tackle my first bomber / 2 engine plane. This build will be of a Revell A-26B I picked on eBay in a bag - literally in a bag. Some of the clear parts may indicate I have parts from two models. The bag did contain two copies of Instructions. I've put the bag in an old D-link modem box Decal sheet looks too yellow for comfort I may be looking for a decal sheet - any recommendation are welcomed. When I washed the parts and moved them to a box more easily accommodated on the bench - I've heard a small part falling - and the carpet monster got it Loosing a part even before I started - that's a first one. I'm looking for help from Gashopon fans - is there any way of obtaining one particular example? A website used for trading/selling, perhaps? Alternatively, does anyone know if Platz intend to follow up their twin boxing of two USAF A-26Cs with an example in French markings? (As available from F-Toys but only in a randomly-chosen set of 10, with no guarantees.) Or as another alternative, a 1/144 transfers set of French A-26s? Or indeed any other than the ones given by Platz? Does anyone recognise this badge? USAF? Hi all you wise ones! Continuing my them of A-26 related questions. I'd appreciate your views on what the two orange colours are on this machine. I guess the fuselage is Fluorescent Orange? Thanks in advance. Martin PS: I'm hoping this is my last on the subject! A 1/32nd Douglas A-26 Invader in view (by HpH?) ?? Source Scale Aviation Modeller International: https://www.facebook.com/ScaleAviation/photos/a.1799764573582175.1073741832.1736227789935854/2353552251536735/?type=3&theater To be followed. V.P. Douglas A-26 Invader. "Hard to Get" is an A-26 Serial Number 44-35710 displayed at The Cavanaugh Flight Museum, Addison, Texas. This is an airworthy aircraft. Pics thanks to GeorgeUSA. After its 1/48th H-75 Mohawk and F-86K ( http://www.britmodeller.com/forums/index.php?/topic/55146-148th-f-86k-sabre-dog-by-musthave-available/?hl=musthave ) kits, the French company MustHave is to release a brand new tool (and not a Revellogram reboxing!) 1/48th Douglas A-26B Invader kit. Box art V.P. Altaya 1/144 A-26B Invader fire bomber.